yet luxurious twill brown exterior Contrasting sage lining. 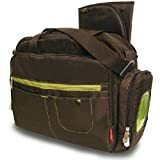 Keep all of baby’s essentials at your fingertips with this Fisher-Price Carryall Diaper Bag in Brown. It features the FastFinder Pocket System, which helps you keep everything neat and organized. With roomy pockets specifically designed for bottles, pacifiers and wipes, this diaper bag always helps you find what you’re looking for. Bring Aladdin to the Little People Disney Princess Songs Palace to hear a waltz! Favorite Little People characters show all the fun there is to be had in and around the classroom through a charming book featuring lots of flaps for little hands to open. Enchant your little one with the timeless tale of Princess Ariel and Prince Eric, two of her most beloved Disney favorites!